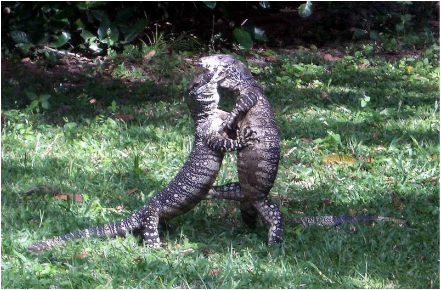 Goannas or monitors as they are also known are a very distinctive group of lizards. One of the most distinctive features of the evolution of goannas in Australia is that their size range is enormous but their body shape has changed very little over time. All monitor lizards are powerfully built, with strong limbs and long, sharp curved claws. The head is pointed and wedge-shaped. The body is slender in young animals, but older goannas accumulate layers of fat and can become quite rotund. The scales do not overlap as they do on some other lizard families and in snakes, but lie up against one another, giving a pebbly appearance to the skin. Monitors are the only lizards that have a deeply forked tongue like that of a snake. There is a sensitive receptor organ on the roof of the mouth, also like that of snakes. The tongue constantly flicks in and out, transferring information to the receptor, which can detect minute traces of odours in the air, whether they are from a prey, a predator or a potential mate. Because the tongue is forked, the lizard can receive information from both sides of its head and figure out what direction the odours are coming from. The Lace Monitor is the second largest lizard in Australia after the huge Perentie which can reach over 2.5 m in length. Lace Monitors can be as long as 2.1 m with a head-and-body length of up to 76.5 cm. The tail is long and slender and about 1.5 times the length of the head and body and the maximum weight is 20 kg. Lace Monitors are not considered endangered and like all other native reptiles are protected by law. Lace Monitors are found along the east coast of Australia, on the ranges, slopes, and adjacent plains of eastern Queensland, New South Wales and Victoria, with a patchy distribution in adjacent parts of South Australia. They prefer semi-humid to humid forested habitat, including river basins and adjacent areas. Although often seen on the ground, they spend much of their life in trees, sheltering in hollows. If approached, they will keep spiraling round to the back of the tree trunk, keeping the trunk between themselves and the watcher. Lace Monitors eat insects, mammals, other reptiles (including snakes), eggs and nestling birds. Using their long, sharp claws, they can easily climb trees; they will then dive into a nesting hole of a bird to take the young birds. Their teeth are long, sharp and curved backwards which makes it very difficult for the captured prey to escape. The bite from a monitor lizard can cause swelling and bleeding in humans. This is mainly caused by a toxic bacteria in the lizard’s mouth but it was discovered in 2005 that Perenties and other monitors also produce a mild non-lethal venom. While this venom has only a slight effect on humans, it may help to subdue small prey animals and birds. It can be quite dangerous to handle large goannas especially alone and Wildlife Rescue South Coast recommends you don’t. The Common or Eastern Blue-tongue Lizard (Tiliqua scincoides scincoides) is widespread in the south east of Australia. Blue tongues have somewhat unusual body proportions: a big head and long body with very short legs and small feet. Their evenly tapering tail is fat and shorter than the body. Like all reptiles they do not produce any body heat. Their body temperature depends on the surrounding temperature and they can be found sun basking in the mornings or during cooler days. On cold days they remain inactive in their shelter. (They need a body temperature of 30 to 35°C to be active.) Blue-tongues like open country with lots of cover like tall grasses, leaf litter, rocks and logs, low shrubs etc. under which they will shelter at night and they also like burrows. Their diet consists of plant matter and small animals, beetles, caterpillars, crickets, snails and even other small lizards. They are very partial to slugs and snails. Blue-tongue lizards have strong jaw muscles to crush big beetles and snail shells. They may also bite in defence when they feel threatened. The blue tongue's main defence strategy is bluff: It faces the threat and opens its mouth, the blue tongue is an unexpected and vivid sight, designed to frighten off the attacker. The lizard also hisses loudly and flattens its body which makes it look wider and bigger. If a bluey was to bite, it would hurt. Fortunately they aren’t well known as biters but are renowned for sticking their scary blue tongue out. The main predators that may cut a blue-tongued lizard's life short are lawn mowers, cars, cats and dogs. Cats are the worst as dogs are often wary of the blue tongue and the threatening behaviour of the lizard to keep a distance. Baby blue tongues may also end up as dinner for currawongs, kookaburras, raptors or snakes. Tiliqua rugosa is a short-tailed, slow moving species of blue-tongued skink found in Australia. The name shingleback is also used, especially for T. rugosa asper, the only subspecies native to eastern Australia. The Eastern Water Skink (Eulamprus quoyii) is a relatively large skink, some specimens reaching nearly 30cm in length. They are fast, active, streamlined lizards which are recognised by their shiny scales and beautiful green-gold colour on the back. The sides are black ﻿﻿﻿with small white spots, while the underside is white or pale grey. Adults defend a territory, often to the point of conflict, although this is usually avoided by the resident lizard warning off potential trespassers ﻿﻿﻿with a complex series of head-bobbing movements. · As reptiles are solar-heated, they like somewhere to warm up in the sun - preferably on a raised rock, but a log or brick path will also do. Make sure the raised rock is next to some ground cover where lizards can retreat. · Skinks and other lizards need somewhere to hide and sleep. Nooks and crannies under logs and rocks are great for sleeping and allows reptiles to scuttle beneath ground cover plants and native grasses for protection. · The tiny critters lizards eat live in the natural leaf mulch found under native trees and shrubs. · Keep cats under control. Keep cats indoors and provide an outside cat run. · Many lizards happily live and sleep in thick tussocks of native grass.